SUMMARY : While speaking at a Hong Kong medical conference, neurosurgeon Dr. Lucas McCrae slips the cloth off a cadaver’s head during a routine medical demonstration, and is overwhelmed with the shock of what’s staring back at him: his best friend, Andy Baer. Stunned, McCrae races back to Seattle to discover that Andy is in fact missing. He may have been murdered by a gang of body snatchers who operate a legit funeral business and make a fortune by selling recovered body parts to medical researchers. McCrae teams up with an unlikely pair—a beautiful but hardnosed female cop and a gang member whose family was victimized by the body parts ring—to try and expose a macabre web of corruption that involves law enforcement, politicians, funeral home curators, and murdered prostitutes. 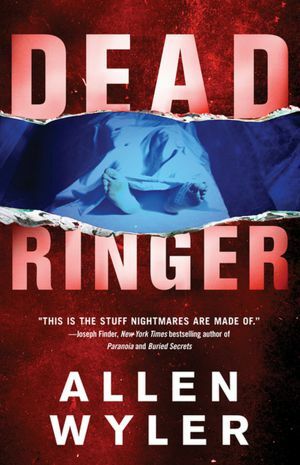 Internationally renowned neurosurgeon Allen Wyler takes us deep into a nightmarish scenario, shockingly ripped from recent headlines, and delivers a horrifically plausible, page-turning thriller. Allen Wyler is a renowned neurosurgeon who earned an international reputation for pioneering surgical techniques to record brain activity. He has served on the faculties of both the University of Washington and the University of Tennessee, and in 1992 was recruited by the prestigious Swedish Medical Center to develop a neuroscience institute. In 2002, he left active practice to become medical director for a startup med-tech company (that went public in 2006) and he now chairs the Institutional Review Board of a major medical center in the Pacific Northwest. Leveraging a love for thrillers since the early 1970s, Wyler devoted himself to fiction writing in earnest, eventually serving as vice president of the International Thriller Writers organization for several years. After publishing his first two medical thrillers Deadly Errors (2005) and Dead Head (2007), he officially retired from medicine to devote himself to writing full time. I wasn't prepared for the visceral impact it would make on me in the first chapters when Allen Wyler's protagonist, Dr. Lucas Macrae unwrapped his "fresh head" specimen for his brain surgery demonstration in Hong Kong and found the head of his best friend staring up at him. Wow! Huge impact for a novel and a great way to start this one running. It never stopped tearing down the proverbial tracks from that moment. Fast paced and relevant, this one had me on my toes. I've never experienced or heard of any of the matters this book covers so I was reading wide-eyed and riveted! His characters are crisp and charming...even the criminals are interesting and absorbing. The criminals sit right on the edge of disgusting, but were engaging enough to have kept me wanting to follow everything they were planning and doing. The young police woman was heroic as well as being brilliant and brave. Great role model for the prostitutes she championed. And, Dr. Mcrae was the epitome of a great friend, unrelenting in his search for truth; and, with the unstoppable curiosity of a scientist. Each of these characters was easily worthy of a book of their own so carefully were they drawn for the reader. Allen Wyler is an accomplished writer who takes us to the edge of reality and drops us into a horrendous scenario. Makes you wonder about cremation and donor programs and choosing your mortuary very carefully! This is a medical suspense novel that will find you tearing the pages off as you read it...so scary and moving along so quickly that you can't help gripping the book with blue fingers. Even when I put it down, I was thinking about it and having to talk about it with my husband. A book you have to talk about with others! I highly recommend this one. Can't believe a major publisher hasn't picked it up! I love books that grip me and don't let go! Thanks, Deb, for the fantastic review! This is definitely on my to-be-read list!